The Hofstra University Class of 2017 are experiencing sustainable studies in real time by planting their own vegetable garden and learning all about sustainable farming methods. Throughout the summer during orientation, our first year students are getting their hands dirty and finding out what it means to grow their own food. The garden is located in the Netherlands complex, which is a residence area for first year students. They are growing a variety of vegetables, including carrots, peppers, melon and lettuce! By the first week of classes, these veggies should be ready for harvest! 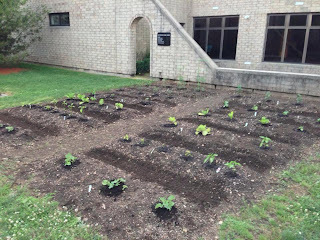 If you're interested in learning more about the vegetable garden, there are more details in the Hofstra Student Life blog. And if you want to pursue environmental sustainability in your studies, we highly recommend visiting the Hofstra University Sustainability Studies department!